* Mediacom 907c, Momo11 Bird, JXD S9000, Eken A90 (first revision) and clones need 907c_compatibility_1.2.x.zip. * Visture V3 and clones need visturev3_compatibility_1.2.x.zip compatibility zip. * Mediacom 910i, Teclast A10t and clones need 910i_compatibility_1.2.x.zip compatibility zip. * ICOO D90W and clones need d90w_compatibility_1.2.x.zip compatibility zip. 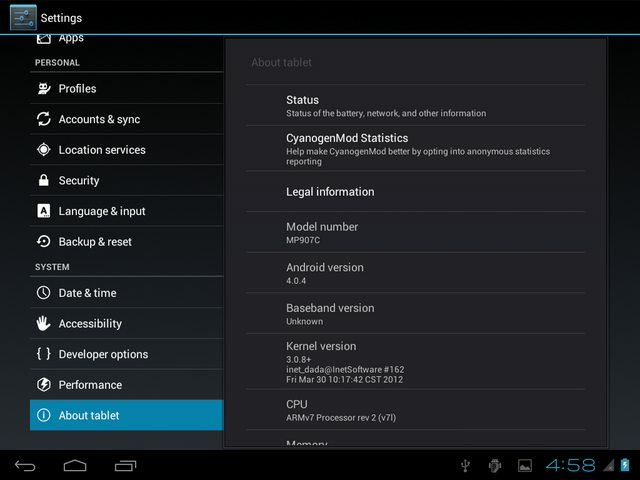 * CEMA10N7 "unknown" device needs cema10n7_compatibility_1.2.x.zip compatibility zip. * Copiate i files zip nella MicroSD o nella memoria interna. * Tornate indietro e selezionate "Reboot system now"
* Cyanogenmod's option to hide status bar now will permanently hide it (not only if the app requests the FULLSCREEN flag). You can enable/disable this option using the included ToggleBar app or checking/unchecking the option from "combined bar"'s settings. * !!! WARNING !!! Compatibility zip 1.2 is required !!! WARNING !!! * !!! WARNING !!! You need to download a new compatibility zip, 907c/MOMO11/S9000 users now requires one too !!! WARNING !!! If you have a /system partition of 300+ MB you can flash "official" gapps from goo.im/gapps, you'll have a working Face UnLock as a bonus. * Legacy compatibility zips include stock kernel with extra modules (like bluetooth, gamepads, ecc.). It's enabled for ad-hoc and wifi direct won't work. USB Audio and DVB-T kernel modules won't work either. * Reboot to recovery non funziona, riavvia normalmente il tablet. Io credevo che nn funzionasse + quella voce nell'app! TARGET_RECOVERY_PRE_COMMAND := "echo -n boot-recovery | busybox dd of=/dev/block/nandf count=1 conv=sync; sync"
Ottimo! un'altra domanda, le gapps le hai messe nello zip xchè così chi le vuole le mette tutte insieme e cmq nn necessarie, oppure sono necessarie a far andare il SO?